As Henry Ford famously said, “If everyone is moving forward together, then success takes care of itself.” Most entrepreneurs can proud themselves with an extraordinary product, the most useful and advantageous service, or a genuine desire to change the world, using social responsibility, aiming to have a wider impact outside of the product area. But how many entrepreneurs actually consider their team as one important factor to success? As an entrepreneur, you might think that your pro- active spirit is going to take you far, as far as reaching your BHAG…all by yourself. Is that so? I guess some people may have come already to the realisation that it’s impossible to start and scale a business all by yourself. And they probably discovered this the hard way. For those who are still at an early stage, let your ego aside and take this advice before you’re doomed to fail your dearest project. You need to surround yourself with inspiring people, with people that can help you achieve your goals. Even though you think you have everything figured out, take a step back and consider how are you going to transform that brilliant idea into a profitable, sustainable business. Now, if you believe that business is about money and the ultimate goal is to get rich. Well, then you’re wrong! Business is more then that, among other elements, business is about people and mutual benefits. A business is based on relationships. Your action plan should have a clear representation including which people do you, as a founder/ co-founder, director, want to be part of your team in order for your project to succeed. Moreover, it’s important to reflect about whom should you associate with and which persons will be there to support you as your business partner/s? Sure, it’s a nice selfish dream to aspire to do everything by yourself, but there are only 24h in a day and so many things to be done. As an entrepreneur acting as a leader is a must! You need to figure out the skills, the roles and responsibilities the people around you should fulfil. If your want to set up a business you should probably consider a board of advisors to provide you strategic advice. As the board o advisors wouldn’t have authority on your business, they can act as your business mentors, sharing from their entrepreneurial experience and expertise in different fields. Their advices come as unbiased insights and ideas from a third point-of-view. Sure, this may sound like a lot to figure out alone. But, if you have an idea and need guidance to implement it, at 1nspiring we are striving to help you find your own business path. 1nspiring offers strategic support, networking opportunities and business expertise. We can help you achieve more by optimising your efforts, input and time invested in the project. Gerben van der Werf, 1nspiring business expert can answer to any question that you might have (https://www.pmpsupervisor.com/). And guess what?? 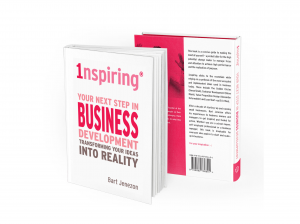 You can download the E-book which includes the Inspiration Canvas and Worksheets to help you take a practical step in your business development ➡ https://www.1nspiring.com/toolkit/.